Novelist Jessica Anthony, author of The Convalescent, and poet Julia Story, author of Post Moxie, are two up-and-coming writers who have both recently published their first books. They sat down with Purdue University’s Visiting Writers Series Coordinator Kristin Griffin and Assistant Director of Creative Writing Jessica Farquhar before a live audience in October to discuss their craft and their first-time experiences with the publishing process. You can click on the following links to listen to audio clips from the conversation. A complete transcript follows. Julia Story earned graduate degrees in creative writing from the University of New Hampshire and Indiana University and has worked as a high school teacher, short order cook, secretary, store clerk, waitress, and professor. Her poetry was nominated for Pushcart Prize and has appeared in Octopus, the Iowa Review and other magazines. Her debut collection of poetry, Post Moxie, was published by Sarabande in May. She lives in Somerville, Massachusetts. Jessica Anthony was born in upstate New York. Her debut novel The Convalescent has received a starred review from Publishers Weekly and was a Barnes & Noble Discovered New Great Writers pick for the fall 2009. Her fiction has appeared in Best New American Voices, Best American Non-Required Reading, and elsewhere. She lives in Portland, Maine. Clip 7: Jessica Anthony on Becoming a Writer:You Can Do that for Credit? Jessica Farquhar: One overlap that we’ve picked up on in both of your works is mythologies. I’m hoping each of you can both briefly talk about your interest in mythology and how it informed your writing. Julia Story: Well, I think that when I wrote the book and in all of the poetry I write, something that always is sort of in the back of my mind is Carl Jung’s psychology. He had this idea. The way he got into psychology was that he felt like he didn’t know what his own myth was and this occurred after he began studying mythology. And so most of his life’s work was about trying to discover what his personal myth was. I really think it’s kind of morbid. I mean, it’s all really ambitious, but I think that’s something that’s at the back of my head when I’m writing. It’s sort of the way of not creating a myth but uncovering a myth, because I believe we’re all kind of powered by myth, because we’re all powered by archetypes. I read and studied a lot of mythology. It’s very detailed. Fairy tales and I guess just “the common stories”—I feel like they’re underneath all literature and all human stories that interest me. Kristin Griffin: Maybe you could summarize for people who haven’t read the book yet the mythology that’s so huge for you with the Hungarian myth. Jessica Anthony: Sure, the novel is called The Convalescent. Half of it takes place in modern-day Virginia with a Hungarian midget selling meat at a bus, and the other half takes place in an invented 9th and 10th century Hungarian society. So, it really vacillates back and forth between present and the past in this way. Actually, when I first started writing the novel, I had no idea that I was interested in myths at all. It sort of came about because I spent time teaching English in Eastern Europe, and I met this Hungarian guy who took me around Budapest and we were talking about the history of the Hungarians. And he said, “Y’know, the Hungarians have no history.” I said, “What are you talking about?” He said, “Well, so much of the story of where the Hungarians come from comes, of course, from the oral tradition and mythmaking and storytelling.” That stuck with me for a couple of years, and when I was living in Virginia, at the George Mason University MFA program, I was walking through a mall and I walked by a McDonald’s, and I saw on the wall this photograph of a bus that said “Meat Bus” on it, and for some reason, it’s one of those random moments where you see that trigger—that little pickle in the back of your neck—and you want to write about it. I went back to my apartment and I started writing, and I was thinking about something Alan Cheuse, who was one of my professors, once said to me: “You have to think about where your characters are coming from, you have to think about where their parents are coming from, and so forth.” But this took me back to the 11th century in Hungary, and in the process of that discovery—because all of us who write fiction know that the process of writing a story is really discovering who our characters are as we go—I learned that there was this wonderful text called the Gesta Hungarorum, which is this actual 12th century Hungarian myth. I just became fascinated with it, and that’s where the book took off from. I don’t know what’s going to happen next. I don’t know if I’m going to do any more myths. I hope so; I found it really interesting. Kristin Griffin: We are both wondering, at what point you realized you were working on this big project: for you, Julia, when you knew you were writing a book-length poem, and for you, Jessica, when you knew you had a novel? Julia Story: It certainly did not happen when I first started writing. It really started more of a journal exercise. I was going through a really a hard time. I was living in Bloomington, Indiana. Gradually, a lot of people I cared about left one by one until I felt like I was completely alone in my house in the middle of Bloomington. Which wasn’t true, I just felt really isolated. So, writing the poems just felt like journal entries to me at first. Just ways of getting stuff out. They kind of became my friends in a way because I felt like I didn’t have any friends anymore. So I was creating these little friends to hang out with. I would write every day. I’d get home from work—I have an office job at Indiana University—and I’d go to my computer, and just create new friends. That’s what it felt like. It was really amazing. I never in a million years would’ve thought that it was going to turn into something else. Then one day, I finally showed them to someone, and they’re like, “This is your next book.” Actually, I already have a book manuscript that I sent out for 5 or 6 years. I don’t know what’s going to happen with that one. So I guess after talking to someone about it, it seemed like, “Oh, maybe this is interesting to other people besides me.” It didn’t feel like it was because it was so internal, so insular. It’s really an internal landscape. I didn’t think it would be interesting to people. But, I guess maybe it is. So, yeah, that’s how it happened for me. Jessica Anthony: I have three novels that I started writing, and I reached that page 80 or 90, where they just withered in my fingertips. They died on me. It’s hard to have that feeling. When you invest yourself in a story for so long and you really start to actualize the characters, and they’re just gone for some reason. And for this book, it was interesting that it started when I was thinking about Susan Shreve. In one of her classes, I was doing this little voice exercise that I was interested in, and it was a messy amalgam of The Stranger and Notes from Underground, so like Dostoevsky and Camus. And I don’t know, there was something about the anti-urgency and the tension that I was curious about it. It interested me. And that, above all, is what kept me going. I had other moments where I felt like the book wasn’t going to succeed, but then I’d return to the voice and I’d again become interested in the characters and it just sort’ve propelled me forward. It was very much like an ocean wave where you’ve got to force yourself to return even when it’s the last thing you want to do. I mean, it took me four years to write. I hope that’s natural. I think it’s natural. Jessica Farquhar: Our next question is about the different narrative threads that you have in your books. For Julia, I’m especially curious about how your book length poem tells a story and at the same time, seems to resist narrative? Julia Story: One thing that’s interesting about Post Moxie is that I did write it relatively quickly. It took two years. But that’s pretty fast, I think, to write a book-length anything. And then it was published much more quickly than I thought it would be. Usually, it takes a really long time to get your first book published—not for everybody. But it was picked up pretty fast. In a way, I feel like I’m still sort of learning what it is all about. And I feel like I’m still kind of writing it in some way…So, it’s a really good question. It’s something I’m still thinking about, too. I think there’s definitely a narrative. The poems, as they appear in the book, are in the order I wrote them. There’s actually no variation in that at all. The first one in the book is the first one I wrote, the last one is the last one I wrote. I wasn’t planning on it for turning out that way. I can’t imagine ordering another book that way. It seemed to work out that way for me. 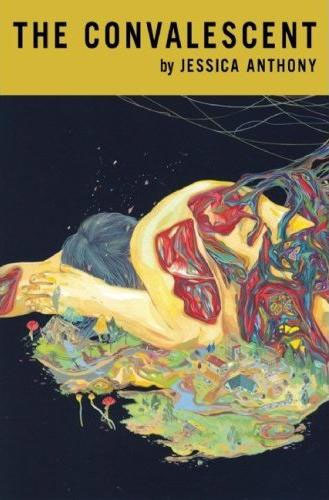 It’s almost an autobiography of this period in my life, but what was going on inside, just super internal. Things were happening externally at the time, because you have to go to work and make money and things like that. But to me, it’s a portrait of this narrative of really internal stuff happening. But, that being said, I do think that it’s about, on some level, the impossibility of being present—completely present—in a moment. It’s impossible, I guess until you achieve enlightenment. The book, in a lot of ways, is about my struggle to stay present just for a second. And I think a lot of the leaps happen because it’s not possible to do that. Kristin Griffin: For you, Jessica, I’m so interested about the dual narratives you have in The Convalescent. I was interested in how you came up with the structure for that, and how you worked through it? Jessica Anthony: I actually wrote them completely separately at first. I didn’t expect them to have any kind of nuance or connection to each other. And I was absolutely delighted when I realized there were all these subconscious connections that I had totally unintentionally written. Pieces just started to snap into place. So, luck? A fancier answer is to say when I sat down to structure this thing, I was thinking a lot about Middlesex, which is one of my favorite novels. I just really admired how Eugenides was able to shift back and forth between the past and present so effortlessly, and spend such little time in the present and have that past story feed the present moment. That was something I was curious about structurally. Kristin Griffin: I was really interested, for both of you, what was the greatest pleasure of these projects? Julia Story: Writing can be really painful, right? I guess what I’ve mentioned about creating these little friends…it sounds incredibly cheesy, but it was such a comfort for me to have poetry in that way. It was cool because, until I wrote this, I guess I would’ve considered the work of other poets to be really friendly and comforting to me, but the fact that I was able to create my own body of work to exist, to help me out—not to say anything negative about MFA programs, but coming out of a program, you’re all going to be out there, trying to get published, and there’s like two jobs for creative writing, so there’s a little bit of competition—and it was really so lovely to write this without thinking about that at all. Not thinking where am I going to send this? Because I used to do that sometimes—I wonder if this would be good for this magazine?—when I’m not even done with the poem yet. It was just really wonderful to get away from that. I don’t know if I’ll ever be there again because I’m not that interested in writing to publish anymore. It might continue to happen, but it was really nice to detach from that. Jessica Anthony: I had a very similar experience, actually: leaving the MFA, starting to write on your own for the first time, and being able to experience a kind of immersion in your work that is not really always possible in the MFA. I mean, you’re busy in the MFA. You’re doing a lot: you’re going to classes, you’re reading a lot, you’re thinking a lot about your craft, and then you’re alone with your work. And there’s something really lovely about that. My favorite moment of the book was when I was at the Millay Colony. (These residencies are fabulous. You disappear for 3 or 4 weeks and just write.) When I discovered the ending of the story, that was when I knew that I had a direction and there was an end in sight. The ending was actually written. I wrote the first half, then I wrote the end, and then it took me two years to fill in the rest. Jessica Farquhar: So you mentioned being comforted by other writers; could you tell us who? What books or authors? Julia Story: I’ve always really had an affinity for Charles Simic, who was my teacher at University of New Hampshire. In a lot of ways this book is homage to him. The World Doesn’t End has really influenced me a lot. I love him. I love everything he’s ever written. And he’s incredibly comforting. I like a lot of Eastern European writers. Kristin Griffin: For both of you, what is your writing process like? Julia Story: I don’t know if this is true of all poets, but I work pretty sporadically. When I was working on this book, it was definitely this daily task that I did. It was like a meditation. I guess my usual practice of writing: when it’s time, I’ll write a lot. I’ll write a couple poems a day. Then I’ll usually blurt out one draft, then I’ll go back to it and do some kind of revision an hour or two later. I’m actually going to a writer’s conference in March. I’m nervous. I think it’s a little different writing fiction just because it’s so much bigger and longer. I’m excited, but I’m mostly nervous about these huge chunks of time for writing, because I don’t know if I’ll be able to do it. I’m actually in the process of finishing my next manuscript now, and that’s the goal, to finish it. But what if I don’t want to write while I’m there? I definitely go through periods where I’m kind of fallow and I need to refill the well, which for me usually means meditation. I guess “refill the well” isn’t a good analogy, because a lot of times it’s not about putting more stuff in. It’s about emptying out. So it’s sporadic. Jessica Anthony: I try to write every day if I can. Ideally, I’m working about 4 hours a day, but you know, life gets in the way, it’s hard to do that sometimes. It took me a while to train myself to do it, to force myself to sit down and actually type and be bad—to write really bad sentences and feel okay about it, then go to sleep and get up the next morning and face it again. It takes a while to give yourself the space, free yourself from the guilt of actually having to churn out bad stuff before you can get to the good stuff, but I think it’s absolutely necessary. I don’t know a single writer, a fiction writer, who doesn’t go through that process of writing pages that are never going to make it. I mean, I’ve got about 200 pages of that book that are edited out. I think it’s par for the course, at least it is for me. Kristin Griffin: What do you do when you’re stuck? Julia Story: I guess when I feel stuck, to me it’s just a message that I’m not supposed to be writing right then. I’m supposed to be doing something else. I don’t put pressure on myself anymore—kind of trying to let go of my identity as a writer, I guess. I want to be a writer, but I don’t want that to be the thing that defines me. The more I let go of that, the less pressure there is to write. Then I actually write more. So, it’s kind of cool. Jessica Anthony: I force myself to stay in the chair when I’m stuck. It’s the only way to get through it for me. I just have to keep going. I find in the typing, in the moving of the fingers, you find your way, dig your way out of it, but it takes work. Jessica Farquhar: How do you hope that your readers will engage with your books? In terms of Julia’s book, it’s more internal. So what do you expect your readers to be able to get from that? Julia Story: Well, I had an interesting experience yesterday. I spent the day in Chicago which is why my voice is fading from talking all day. [laughs] One of my former classmates at I.U. teaches at Triton College, which is a two-year college in northwest Chicago, and they read this book this term and were asking questions about it. It was really interesting to see what they were getting from it. They were asking really specific questions like, “What does this line mean?” which was really difficult to answer. So I, of course, asked them, “What do you think it means?” I was very moved, actually, at how they responded to it. I don’t know if it’s the way I would have wanted or intended someone to respond to it, but one thing I’m picking up on the feedback from it is the fragmentation of it. The partial narrative really speaks to people in a way, which is, kind of surprising to me, but it makes me really happy because I feel like that’s what we’re doing right now. That’s what life is: It’s not some perfect trajectory, it’s just strange juxtapositions and lots of movement and it’s actually kind of random, and sometimes there’s not a lot of meaning, and that’s okay. It seems to be, I don’t know, comforting to me. To me that’s not a scary notion. I like that it’s comforting to other people too, and not something to be avoided. Kristin Griffin: And maybe for you, Jessica, what it was like to let your baby go? Jessica Anthony: It’s really difficult! It’s hard, you know? You spend so much time in this tiny little room for four years with this crazy little Hungarian, you know? [laughs] And then suddenly people know about him, and they’re interested, and they want to ask you questions about him. It’s strange at first. I guess I would want a reader to be entertained, to be immersed, ultimately, to care about the story. Kristin Griffin: From the time you finished the manuscript to when you actually held the printed book in your hand, what was that journey like for each of you? Julia Story: My first book manuscript I finished in 2003, and I’ve been sending it out. It was finalist, semi-finalist, and nothing was happening because, you know, to get a book of poetry published you generally have to win a contest. With this, I thought, I’m just going to send it out, see what happens. Then I got a phone call two months later, and I wasn’t ready at all. It was really hard and sad. It was just so shocking. It wasn’t what I’d planned at all. I mean, I’m just so happy with it, I love it, but when I first took it out of the box, it just felt really surreal. It’s still that way a little bit. Jessica Anthony: So McSweeney’s actually publishes their books quite quickly after you go through a really grueling editorial process. It took about a year to edit the book with Eli Horowitz and we went back and forth quite a bit. There’s actually a funny story. He kept asking me to rewrite this one scene. I gave him six versions of the same scene until finally I thought, the original scene is what’s going to work, so I sent him my seventh version and said, “This is it, this is what’s going to work,” and it was the exact same original scene, and he called me and said, “Jess, you nailed it!” [laughter] After that, it was only four months from the time I turned over the manuscript, which is quite unusual, I think. Most houses take over a year. Jessica Farquhar: So can you guys talk about sort of what comes next, now that you have your first book out there in the world? Julia Story: Well, right now I feel really focused on Post Moxie and promoting it. I am working on another manuscript. I’m going to Vermont Studio Center which is in Johnson, Vermont, in March, which is the most miserable time of year to be in Vermont. [laughs] I’m hoping that I’ll finish my next manuscript then. Sarabande will read it. I don’t know if they’ll be interested or not, but if not, then I’ll start the contest process again, which is fine. I mean, I feel okay about that. Jessica Anthony: I’m just starting another novel. Kristin Griffin: Is it different, having one behind you? How has that impacted how you’re approach to this new novel? Jessica Anthony: It’s a challenge, I have to say. People have all these stories about the second book, right? How the sophomore effort is a great big failure. It’s like this is a common story. I don’t know if I believe that to be true, but you definitely have an awareness that a piece of you is out there, so when you sit down to write, you’re kind of rubbing elbows with it a little bit as you’re working, and that can be a discomfiting sometimes. I think it takes a little bit of extra effort to really divorce yourself from the history and create something that feels completely fresh and new, and will feel fresh to the reader. That’s been a bit of a challenge for me. Kristin Griffin: For a lot of us out in the audience who are working on what we’re hoping will be our own debuts: If you could go back and give yourself some advice before this all got going for you, what would you tell yourself? Jessica Anthony: I guess I would probably say, make sure you’re writing the material that you would most want to read. If you were to go to a bookstore and pick out a book, it would be your book. Julia Story: Yeah, it would be sort of similar for me. Just to sort of trust myself. I think it may be just a result of getting older. I’m not trusting that I’m going to write something everybody likes, or something that’s good, but that I’m going to write something that’s honest, and it’s me. What else could I write? [laughs] I’m not pretending to be somebody else, and I’m not interested in writing to a certain genre, or to appeal to a certain audience, and I don’t actually think that was always the case. When I was a younger writer, I was a lot more self-conscious, which I think all students of creative writing are—you imitate. It’s a way to learn. I may be imitating unconsciously now, but I just trust that what I’m doing is what I should be doing. Kristin Griffin: Can you talk about the move from being an MFA—from studying writing in a more formal environment—to moving out on your own? What observations do you have? What’s out there? What’s new and exciting? Julia Story: I think at first, I really missed some parts of the MFA program. My whole life was about poetry! And I was around poets and fiction writers all the time like MFA students are here, probably. You guys are in classes together all the time. Everything I did was about poetry. I was teaching, I was talking about it, I was writing about it. I guess there was a slight depression when I finished, and I had a hard time finding work. I still do, especially with the economy and everything, but it was hard to go from this insular, protective world of the poet to sending out all these applications to be a secretary, just do something to earn money and try to keep writing. So that part was sort of hard. I think that the poetry community that I’m in now where I live in Boston, I really appreciate because not everybody I know there went to an MFA program. It’s a really diverse group of poets. I’m friends with people from a lot of different poetry communities, and that’s cool. It’s not all academic which I find a little refreshing. That’s a positive thing. Jessica Anthony: Yeah, I mean it’s a funny thing to shift out. You have this amazing community at hand every day and then suddenly you don’t. You kind of have to learn how to cope with the extraordinary loneliness. I did that by adjunct teaching. I was just teaching part time in Portland, Maine, and it was actually a nice situation for me because I didn’t have any other duties as a professor. I really just taught my classes and had my conferences, and that time was enough for me. Make sure that you give yourself time. It’s scary. Money, the financial piece of it, can be really impossible, but I guess you have to start learning how to think creatively about how to make money and make time. Audience: I really enjoyed your book. I actually read it cover to cover in Steak n’ Shake. Julia Story: Thank you! We don’t have Steak n’ Shake in Boston. Audience: I really enjoyed it and I want to formulate some questions based on what I struggle with. I’ve been out of the MFA for about three and a half years and had one book manuscript, and the more I looked at it, the more I started cannibalizing it for other things, and now I just have sort of a hot mess. You mentioned that you have another book manuscript that you’ve been shopping around. Do you go back to it, or do you just kind of detach from it and let it go at some point? Julia Story: Yeah, I don’t feel interested in that manuscript anymore. I don’t know why. I love the poems I wrote at the University of New Hampshire. I started that program in 1997 and that was a long time ago, so I don’t really have a connection to them anymore. I think a lot of the poems in there are really good. I think that it maybe it could get picked up at some point, so I’m not ruling out going back to it at some point, but right now I don’t feel super invested in it. That’s not to say though, that will happen for you. Audience: I read in another interview that you said that the poems in Post Moxie are pretty much how they came out, both in the order and how they were written in not having a ton of revision, and I was wondering how that has affected your revision process. I mean, with your manuscript now, it sounds like maybe it was a special project, which is something different for you. How has that changed how you approach the revision process? Julia Story: I did revise a lot before. I was in two creative writing programs and was constantly in workshops, and that’s just what you did. I feel sort of guilty telling people that I didn’t revise these poems because I’m not practicing what I preach as a teacher. Part of why I think it was difficult for me to revise when I was writing this was that there were prose blocks, and I had this set up on the computer, which I hadn’t done before, and basically I felt like I was just sort of pouring the words into the boxes. It just was so organic, for lack of a better word, that it felt like I had no business changing them once they were out. It just felt like a little tarot card, a little printout of what was going on with me when I wrote it and I couldn’t go back and change it because it was so present and immediate. I’m re-teaching myself to write in lines again because I wrote prose blocks for two and a half years and I don’t know how to write a line anymore. [laughs] It’s hard! So now I’m constantly revising, but it’s mostly the line breaks. I have to read it out loud to get a sense of the line. I’m reading and reading and reading out loud; that’s how I revise. Audience: Did you discard any? Julia Story: I only discarded one, and I don’t even remember why I got rid of it. I just didn’t like it. Audience: I was interested in how you felt about [Dan Chiasson’s] introduction to your book because sometimes they can be sort of awkward and reaching, and I thought this was an unusual introduction. Julia Story: That was on the little postcard announcing the book too, which my grandma got. That word is actually in the book so I guess Grandma’s going have to see it sooner or later. It’s really hard to answer. Dan helped me so much. He actually helped me edit because he lives in Massachusetts. So we met and he had amazing suggestions for edits. It’s funny because a review that was written recently was really harsh about that, and I felt really bad about him seeing that and thinking I had some say in that. The tone is negative toward prose poetry, I think, in the intro. I did talk to Sarabande about that and they said, Well, Dan’s sort of a negative guy. That’s not to say he’s not an amazing poet; he is, and he’s a really great person. It was a little hard to read the stuff about prose poetry because he was sort of negative about it, and I writeprose poetry [laughs] and he was using it as a way to say something good about my work. The tone about prose poetry was hard because I really admire a lot of it. Some of it is not good. I can’t say all prose poetry is amazing, but it’s a form I found so interesting. The first time I read this, I thought, Oh, he doesn’t find this interesting, which is strange, so it was hard at first, but he’s the judge, he chose the book. There is a little part of him in this in the intro, and that’s okay with me. Audience: Can you talk about the things you discovered about prose poetry while writing this book? Can you talk a little bit more about the riches, if you will, in a prose poem? 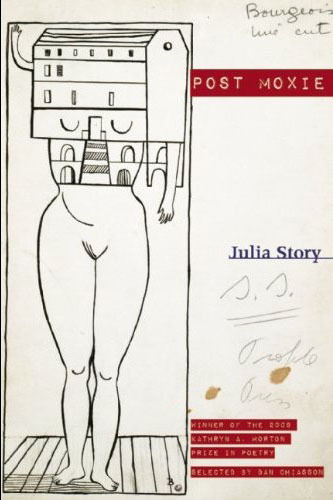 Julia Story: I guess I just like it for a narrative, and I think, for these poems, the juxtapositions and the leaps from sentence to sentence can be so strange that I think the form sort of helps to glue it together a little bit. I don’t know if that’s people’s experience in reading it, but I do like that with a lot of prose poems, the block, the way it just looks sort of like a window, or, I don’t know, just sort of a cube of language. There’s something about it, distilling a narrative into something that small. Not all prose poems are small, so I feel like I’m not talking about this very eloquently. But I guess I’m just talking in terms of the small prose blocks that I used. They just really distill the narrative down to its essence. There’s nothing extraneous. I guess there’s something messier to me about regular poetic lines. Audience: You talk about spotting a poster in McDonald’s. Can you talk about the origin of your protaganist? Jessica Anthony: He actually started out as Adrian Brody. He got shorter as I wrote. What I said before about discovery as you’re writing is, I think, relevant to answering this question. When you begin with voice, the constant shaping of character is your writing. As things happen to his character, and you begin to realize what he’s capable and not capable of, he begins to take a stronger, clearer form in your mind. Did I sit down to write this character? Did I say, oh, I want to write about this near midget? No. I think the near midget was a consequence of the voice choice. This incredibly sarcastic, anti-urgent voice that was resisting, that for some reason became the whole package for me. I started to be able to visualize what he looked and smelled like, and he just became this fetid little creature, and that started to play a whole role in the historical piece, as well. For those of you who haven’t read the story, it’s like this invented tribe, the losers of the losers of early medieval time, and he became sort of the modern manifestation of his wayward, lost people. Audience: Was it frustrating going back and changing the character, what you already wrote about him? Jessica Anthony: Not so much because the forward momentum of the book stayed the same so even as I was taking scenes out that weren’t keeping us on that path, I still felt that throughout the process, I was shaping as I went in some weird way. I’ve talked about the wave, and that really is applicable. It’s kind of a hard thing to explain. You lose pieces of your character as you go, but you’re doing that on purpose. You’re shedding the character in order to be able to visualize them better. For me it’s all about the scene, right? Kerouac called it the “book movie.” Who quotes Kerouac? Nobody! But you see it in your mind, and when you reach this place where you can actually visualize this character, that’s where the interest, the kernel of interest sustains you. At least it did for me. Audience: I’m curious, what were the very first steps in your adult life that you took toward becoming a writer? Did you write mostly for yourself? Did you write for magazines? Was it something you put a lot of work into as an undergrad or did it kind of start with the MFA? Jessica Anthony: It was a total accident. I was always a reader, and I loved reading ever since I was a very little kid, and then I went to Bates College in Maine, and in my junior year I went abroad to study at the University of Manchester, and I was trying to find a subject to study and I was looking through the catalog and I saw creative writing, and I thought, You can do that for credit? Crazy! This was in 1994. So I wrote a short story and it was terrible, and they took me in the class and I started writing fiction. I also actually studied poetry for a time. Good that I left! I’ve been writing stories for a long time, but I didn’t think seriously about becoming a writer until I was about twenty-four, twenty-five years old and I was at an utter loss about what to do with myself. I’d had like twenty-six jobs, and was basically a vagrant and a criminal. [laughs] No, not a criminal. I was living in Alaska and in Eastern Europe. I was all over the place, and then I asked myself, What’s been the one consistent thing that I’ve done? Well, I’ve been writing fiction, and why? So then I talked with someone about the MFA, and I bristled at first when I first heard about the MFA, you know, I wasn’t sure about it because people have these problems with the MFA, which, I think, is a load of crap, basically. I mean, the MFA is amazing, so I got myself there, and once I was there I started to feel like my roots were there. Audience: Here’s a question for both of you. I’d like to know what was maybe the most important thing you learned in the MFA program that you really didn’t know before? You might need to compare it to what you learned after the MFA program. Julia Story: For me, I think I went into the MFA looking for a mentor, sort of a guide who would help me work one-one-one with me with my writing, and I guess what I learned was that I didn’t really need that, or want it. Not to say that my professors at IU weren’t amazing—they were—but to have one mentor and guide wasn’t really what I needed. I preferred to have a community, and I learned a lot more from my peers. They were amazing teachers for me. I didn’t know that was going to be the case there. Jessica Anthony: Yes, I think that’s really accurate, that’s really true. It’s about the validation. You’re writing stories, you’re creating imaginary lives and people don’t sort of wrinkle their brow and look at you funny. They take you seriously. You start to take yourself seriously. You say, I’m actually going to be doing this for three years, and that’s a pretty extraordinary discovery. Julia Story: Yeah, yeah. I remember when I was about nineteen, which was about the time that I became really serious about poetry. I was with a friend of my aunt, I think it was in Iowa, and she asked me, “So you’re an English major. What do you think you want to do with it?” And she just laughed in my face. It was so painful. I guess I was supposed to laugh with her. I was really serious about it, I didn’t know it was just a joke, and then when I got older I realized, oh, people think this is a joke. So the MFA program was really affirming, and was like, oh, there are all these other people who want to do this too, and it’s okay. Audience: How long do you think it takes to keep writing bad prose before the narrative takes over for itself? Audience: How do you resist putting too much of yourself in the novel? Jessica Anthony: For me it’s about making sure that my mind is firmly rooted in fiction, and that I’m not drawing too closely from autobiography. I’ve been talking about the novel, and you’re probably saying, “Not a problem, Jess.” [laughs] But there’s an emotional truth, an emotional, autobiographical truth, of course, that’s carried through in the character, and it can be tricky sometimes, but as long as I continue to return to that fictional place, you know, the bus, the arena, that particular space that this character inhabits, I know that I’m in his voice. I also listen to music a lot when I write, and I’m wearing my Queen shirt because I wrote the novel to Queen. Seriously, there’s something about having that kind of like soundtrack for the book, and if I had trouble getting into the voice of the character, I would just play a little Queen and I was back. That sounds sort of like a muse, or something that sort of gets you into that space. Jessica Farquhar: Thank you both so much!